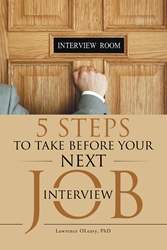 With the job market more competitive than ever, candidates need to possess the useful knowledge of current interview practices prior to their job interviews. A consulting Industrial/Organizational Psychologist, Dr. Lawrence O’Leary, noticed a growing trend in the format many organizations were utilizing when looking for new hires. Veterans will also greatly benefit from the book with an entire chapter devoted exclusively to them that showcases and demonstrates how Veterans have the ability to present the value of their specific military experiences for specific civilian jobs. Lawrence O’Leary, PhD, is a consulting industrial/organizational psychologist and the director and founder of his own consulting corporation. He’s the author of four previous books on employment and has taught seminars, as well as undergraduate and graduate courses, and supervised graduate interns at the University of Missouri-St. Louis, Washington University-St. Louis, Webster University, Southern Illinois University and St. Louis University. He is married and has three children and lives outside of St. Louis, Missouri.